» .. when I regard all beings with my Buddha eye, I see that hidden within the klesas of greed, desire, anger, and stupidity there is seated augustly and unmovingly the tathagata’s wisdom, the tathagata’s vision, and the tathagata’s body. Good sons, all beings, though they find themselves with all sorts of klesas, have a tathagatagarbha that is eternally unsullied, and that is replete with virtues no different from my own.» (Buddhism in Practice, p. 96). The Buddha of this scripture urges faith in its teachings on the part of its auditors and insists that the upholding of this sutra will turn the faithful follower into a «Dharma King», a Buddha like himself. The ultimacy of the tathagatagarbha doctrine (from the Mahayana standpoint) as articulated by the sutra is indicated by the exalted nature of the audience to whom it is delivered — an audience which includes Manjusri (embodiment of supreme Wisdom), Avalokitesvara (the manifestation of highest Compassion), and the future Buddha, Maitreya (personification of limitless Loving-kindness). 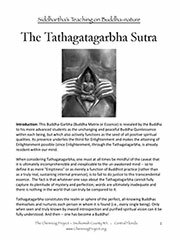 The Tathagatagarbha Sutra constitutes one of a number of Buddha-nature sutras (including the Mahaparinirvana Sutra, the Srimala Sutra, and the Anunatva-Apurnatva-Nirdesa scripture) which unequivocally declare the reality of an Awakened Essence within each being. This is not merely a «potential», a seed that gradually grows bigger (the Buddha sees the Tathagatagarbha in its fullness right here, right now in each person), but an actual, radiant, already perfect state of Awakening, of which the individual must become cognizant, or into which (to use the imagery of the Nirvana Sutra) he or she must enter and penetrate. Buddhahood is thus taught to be the timeless, virtue-filled Real (although as yet unrecognised as such by the deluded being), present inside the mind of every sentient being from the beginningless beginning. Its disclosure to direct perception, however, depends on inner spiritual purification and purgation of the superficial obscurations which conceal it from view. Buddhism in Practice (Princeton University Press, Princeton 1995), ed. by Donald S. Lopez, Jr.